As a whole, cash back credit cards are uniquely straightforward. You buy things, you get cash back. Easy, right? Right! If you're attracted to the simpler things in life, and prefer direct savings on the things you buy most, a cash back credit card is what you're looking for. But the fact of the matter is not all cash back cards are created equal. With the best cash back credit cards on our list, you can rack up to 2% cash back on all purchases, whereas some of the lower end cards will only give you a 0.5% return. Or, you can get up to 4% cash back on select category spending (like gas or groceries) and up to 10% on certain spending for a limited time as a welcome bonus. What about all the other cool features that come with credit cards? When it comes to insurance coverage and premium perks, you might not be getting as much with a cash back credit card as with a travel rewards credit card, since many cash back cards don’t even give you the most basic of travel insurance. But some cards on our list might surprise you. This list is the place to start. Review all 10 top cash back cards here. If you’re looking for the best cash back card in Canada, look no further than the . Plus, you'll earn 10% cash back on all purchases for the first 3 months (up to $2,000 spent). As an example, if you spend $1000 on groceries per month, you're looking at $40 in cash back, and if you spend $400 on gas, that's an additional $16. So, in one month, you'd get $56 right back in your pocket. On top of a great return on spending, this card also comes with awesome benefits like solid insurance, 24/7 concierge service, and Visa Infinite experiences. What really makes it stand out among its other top 10 cash back competitors is the fact that Scotiabank will waive the annual fee for you for the first year – so you have a chance to really try it out and evaluate if the $99 annual fee makes sense for you and your spending habits. One of the top cash back cards in Canada, the , also offers a slew of great perks. For starters, you'll get a welcome earn rate of 6% on all gas, grocery and recurring bill payments for the first 3 months, up to $3,500 spent. This card also gives 3% cash back on all recurring bills charged to the card (the highest earn rate for this specific category of all Canadian credit cards), as well as all grocery and gas purchases. the ability to redeem your cash back rewards any time you want. This card offers quite a bit, for a $120 annual fee for the primary cardholder ($50 for authorized users). The best American Express cash back card is the . The reason why this card stands out is that it gives cardholders a straight 2% cash back (which is the highest flat earn rate of any card) on all purchases…and that’s after the introductory 5% cash back for the first 6 months (capped at $300). As an added bonus, American Express cards have no minimum income requirements, making it easier to qualify for than many of the other best cash back cards on the market. It also comes with a decent insurance package, free secondary cards, and an introductory balance transfer rate of only 1.99% for 6 months. 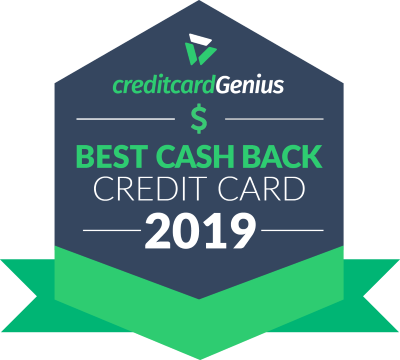 You might be surprised to see this card on our list for best cash back credit cards since it doesn't award you with straight cash back rewards, but we still thought the deserved a mention. Why? We're glad you asked. Any spending done in the higher earn rate categories will give you a 3.2% return when redeemed for statement credits. So, if a lot of your spending falls under gas, groceries, and entertainment, this card is definitely one to consider. If you decide to redeem for travel instead of statement credits, you're looking at an increased return of 4% on your spending. You'll also be covered by a great insurance package which includes 14 different kinds of purchase and travel insurance, including Emergency Medical for people 65 and over. When it comes down to choosing a credit card that's right for you, there are some pretty important details to consider. A flat cash back rate on all your spending is great if you don't want to have to worry about spending in certain categories to maximize your rewards. However, high earn-rate categories allow you to get increased cash on specific categories like gas or groceries. So, if you have very high spending on the same things each month, then looking for a card with a spending bonus can increase your payout. Some cash back cards even allow you to choose the categories on which you want to earn rewards. Looking to really max your rewards? Consider combining a flat earn-rate card and a high earn-rate category card in your wallet – use the latter for its specific category spending, and use the flat-rate card everywhere else where you wouldn't get the bonus. Hint: Enter your spending breakdown by category on our compare credit cards page to factor that in. You'll also need to be mindful of caps or tiers on your earnings. If there are cash tiers in place, or a limit on the amount of total cash earned, it can be a big drain on your payout. That's all factored into our calculator as well so you can easily compare apples to apples. Another important thing to note is how you get paid your cash back. Most cards just give you a statement credit, but a few let you choose between cheque, bank deposit, gift cards, travel, and more. The frequency of redemption is something to take note of as well. While some cards will only allow you to cash out once a year, others have an on-demand option, which gives you more freedom with your cash back rewards. With cash back card, sign-up bonuses aren't nearly as common (or as impressive) as the bonuses that come with many travel credit cards, that doesn't mean they don't exist. They often come in the form of increased cash back earnings for a limited time with a cap on the maximum bonus cash you can earn. Credit card insurance coverage can provide peace of mind when you most need it. And although you might not get as much insurance with a cash back card as you would on a premium travel card, it's still something that could factor into which card is best for you.